Cochlear implantation has become a common method of rehabilitating severely to profoundly deaf children and adults. Standard cochlear implantation requires an extended postauricular and scalp incision and large flap, mastoidectomy, facial recess approach, cochleostomy, and insertion of an electrode into the scala tympani. The most common complications associated with the standard approach to cochlear implantation include flap breakdown and electrode misplacement. Limited data concerning minimally invasive techniques have been described in the literature. Generally, such techniques involve a less-extensive incision and less-invasive manner of securing the receiver/stimulator onto the skull or, more recently, the use of image-guided navigation for percutaneous drilling from the surface of the mastoid directly to the cochlea. In recent years, the standard approach to cochlear implantation with a large incision has been challenged by successful implantation of cochlear implants in numerous patients with a much smaller incision and a less-invasive approach. In addition, CT-guided preoperative planning of the drilling path and intraoperative CT guidance appear promising, which could further reduce the invasiveness of the procedure. However, this technique remains to be proven as comparable in safety and efficacy as the established minimally invasive techniques in Technique. The anatomy of the inner ear consists of the bony labyrinth (see the image below), a system of passages making up the following 2 main functional parts: (1) the cochlea, which is dedicated to hearing, and (2) the vestibular system, which is dedicated to balance. 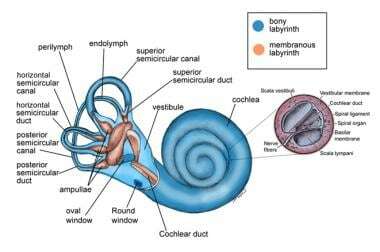 The cochlea is a bony, spiral-shaped chamber that contains the cochlear duct of the membranous labyrinth. 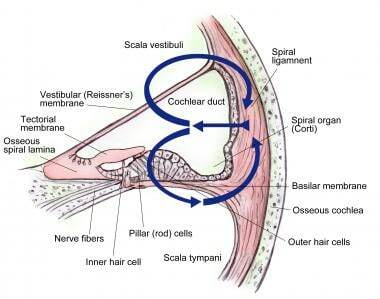 The sense of hearing is provided by receptors within the cochlear duct. A pair of perilymph-filled chambers is found on each side of the duct. The entire apparatus makes turns around a central bony hub, much like a snail shell. See the image below. For more information about the relevant anatomy, see Inner Ear Anatomy and Ear Anatomy. Campisi P, Hayward L, Papsin B. Mitek QuickAnchor fixation of cochlear implants using a minimal access technique. Int J Pediatr Otorhinolaryngol. 2005 Dec. 69(12):1655-8. [Medline]. Davis BM, Labadie RF, McMenomey SO, Haynes DS. Cochlear implant fixation using polypropylene mesh and titanium screws. Laryngoscope. 2004 Dec. 114(12):2116-8. [Medline]. Stratigouleas ED, Perry BP, King SM, Syms CA 3rd. Complication rate of minimally invasive cochlear implantation. Otolaryngol Head Neck Surg. 2006 Sep. 135(3):383-6. [Medline]. Mann WJ, Gosepath J. Technical Note: minimal access surgery for cochlear implantation with MED-EL devices. ORL J Otorhinolaryngol Relat Spec. 2006. 68(5):270-2. [Medline]. Mack KF, Heermann R, Issing PR, Lenarz T, Schwab B. Four years' experience with the minimally invasive surgical approach in cochlear implant surgery. Minim Invasive Ther Allied Technol. 2006. 15(3):187-92. [Medline]. Davids T, Ramsden JD, Gordon KA, James AL, Papsin BC. Soft tissue complications after small incision pediatric cochlear implantation. Laryngoscope. 2009 May. 119(5):980-3. [Medline]. Labadie RF, Chodhury P, Cetinkaya E, Balachandran R, Haynes DS, Fenlon MR. Minimally invasive, image-guided, facial-recess approach to the middle ear: demonstration of the concept of percutaneous cochlear access in vitro. Otol Neurotol. 2005 Jul. 26(4):557-62. [Medline]. Majdani O, Bartling SH, Leinung M, Stöver T, Lenarz M, Dullin C. A true minimally invasive approach for cochlear implantation: high accuracy in cranial base navigation through flat-panel-based volume computed tomography. Otol Neurotol. 2008 Feb. 29(2):120-3. [Medline]. Majdani O, Rau TS, Baron S, Eilers H, Baier C, Heimann B. A robot-guided minimally invasive approach for cochlear implant surgery: preliminary results of a temporal bone study. Int J Comput Assist Radiol Surg. 2009 Sep. 4(5):475-86. [Medline]. Labadie RF, Balachandran R, Mitchell JE, Noble JH, Majdani O, Haynes DS. Clinical validation study of percutaneous cochlear access using patient-customized microstereotactic frames. Otol Neurotol. 2010 Jan. 31(1):94-9. [Medline]. Minimally invasive cochlear implant surgery.